A GRIP ON SPORTS • Monday mornings mean a new beginning. Whether it’s work or school, for most of life the day actually begins the week. The same can be said for the West Coast Conference tournament. Read on. • The preliminaries began last week for the WCC schools. But ever since BYU entered the league, a league made up of mostly religious-based schools even before the Cougars joined, Sunday has been a day of rest. Or a day of frolicking in Las Vegas, whichever fits your definition better. Either way, no one played a game in the Orleans Arena yesterday. The women’s semifinals will be followed by the men’s, with Gonzaga playing the early game. It’s a surprising ancillary benefit of the Zags become one of America’s teams, that earlier start time. Remember when ESPN used to want to put them on at 9 p.m. our time every week? Those days are gone. The Bulldogs pull in enough eyeballs these days – don’t most Final Four participants? – the Worldwide Leader wants them on at a time when East Coast folks can watch. Makes my life easier, that’s for sure. And yours, if you want to watch the Zags face off with San Francisco and still get a decent night’s sleep before heading to work for Taco Tuesday. • We had a pretty good relationship with former Gonzaga women’s basketball coach Kelly Graves, who lived near us on the South Hill. During the offseason we would get together about once a month or so at Starbucks and talk hoops and New Mexico basketball. I still use an inbounds play he drew up for me on a coffee-stained napkin. He didn’t run it last night, but his Oregon Ducks didn’t need it, as they hammered Stanford 77-57 to win their first Pac-12 tournament. In his fourth season in Eugene, Graves’ squad won the conference’s regular-season title and the postseason crown., They will head to the NCAA tournament as, more than likely, a two seed. If you wondered why Graves left Gonzaga, where a WCC crown and an NCAA berth were a given most every season, last night’s dominance in Seattle explained it. This Oregon team has a chance to not only make the Final Four – he’s come close twice, once with GU and last year with the Ducks – but win the title, though, as is the case every season, there is Connecticut to overcome. That may have happened someday at Gonzaga, but the road was rockier and harder to envision. There is a larger divide in the women’s game between the haves, the sort-of-haves and the have-nots. Oregon is in the first category these days, and Graves is a big reason why. • One last note and it’s somewhat personal. As longtime readers of this column know, my father was a track guy. He loved the sport. And one person he talked admiringly about when I was young died yesterday. For my dad there were many seminal moments in his life, from Pearl Harbor to the moon landing to Kennedy’s death. But the sporting one he talked the most about was Roger Bannister breaking the 4-minute-mile barrier. That mark was as sturdy, it seemed, as the sound barrier. And when Bannister burst through, it made as much noise. To my dad at least. To him, Bannister was god-like. He had done something no one had done. He was the first, and for dad, he was always the best miler. When I went off to UC Irvine and shared a dorm suite with Steve Scott, who broke four minutes more than anyone ever, I was rightfully proud. But every time I would mention his latest feat, dad would steer the conversation back to Bannister. He was younger than The Captain, but part of his generation, a generation that routinely did things other generations hadn’t done. And, for as long as he lived, Sir Roger was able to claim he did it first. And my dad was able to claim a part of it as well. WSU: The NFL combine isn’t over (it finishes today), but the four Cougars who participated are finished. Theo Lawson checked in with their performances and gauges who did well and who hurt their standing. … Elsewhere in the Pac-12, this week’s tournament in Las Vegas (it begins Wednesday) should go a long way toward determining how many conference teams play on in the NCAAs. UCLA could use a win or two more. So could USC, Utah and Arizona State. … Other schools, like Arizona, are thinking about seeding and awards. … Colorado is headed to the NIT unless it wins four times. … Oregon has a freshman that expects some honors this week. … The conference is not a force in the rankings. 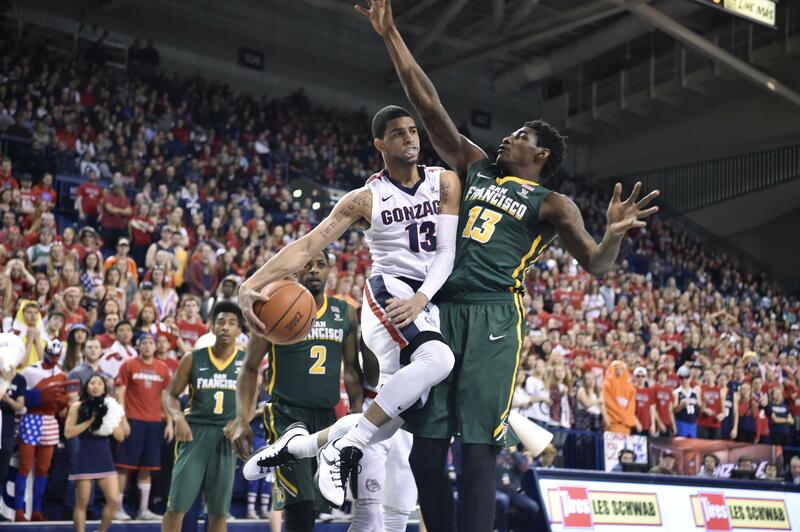 Gonzaga: There is some discussion going on in Las Vegas concerning the news from last week the Mountain West and GU are dancing around a bit. John Blanchette weighs in on the possibilities, covering both sides of the spectrum in his column. … The Zags’ opponent tonight, USF, is playing better. Jim Meehan previews the matchup and the Dons’ best player. … The women also play USF and Whitney Ogden also has a preview. … The baseball team swept a doubleheader yesterday in California. … Former Gonzaga player Zach Collins had the best game of his young NBA career Saturday night. … Around the WCC tournament, Saint Mary’s and BYU have the late game tonight, with the winner still in the hunt for an NCAA berth. EWU and Idaho: Both the Vandals and the Eagles had representatives on the Big Sky’s women’s all-conference first team. Whitworth: The Pirates split a baseball doubleheader yesterday. Motorsports: Earl Wham, influential in this area’s motorsports history, died Friday. Chuck Stewart has Wham's obituary. Mariners: Despite another pitcher on the injury list, the M’s picked up an exhibition win. Seahawks: Could the Hawks have two Griffin brothers on defense? The price would be high but it sure would be fun. … Michael Bennett may be on his way out the door. Sounders: Seattle’s early season schedule has been brutal, what with Champions League matches underway. So the Sounders rested Clint Dempsey in their MLS opener and lost 1-0 to expansion LAFC. … Seattle built its roster around Jordan Morris. He’s out. Can the Sounders recover? … Portland also fell to a Los Angeles team, losing to the Galaxy in Giovanni Savarese’s coaching debut. Published: March 5, 2018, 7:57 a.m.